Gratitude is a spiritual practice. There is a three-step process to giving thanks that completes a spiritual cycle. Practicing these three steps deepens our foundation for greater appreciation, and helps us mature to a level of consciousness where we are primed to receive the good that awaits us. Tune in (or read about) the three steps of practicing gratitude to deepen your process of personal growth maturity. Living a heart-centered life means to live not simply by logic alone, but to have decisions funneled through and integrated with the heart. How do we, as heart-centered entrepreneurs go about living integrated lives where there is a congruence of head and heart? In the bleakest of times, be it in our personal or professional lives, what is the practice that will sustain positivity? Join us in this heart talk of possibility, with a practice to return to the heart of who we are: integrated, aligned and joy-filled beings in moment-to-moment expression. Download the FREE meditation to bring your home to your heart. The question here is this: when we feel stuck - how do we know What to do next? I’ll share w/you what my resource is ... and how to tune in to the possibility that is YOU! At the end of this episode, we will work through and define for YOU what is knocking on your heart so you can be present to what REALLY is motivating you. Living fully is a practice of mindful awareness, moment to moment. We become conscious of how our thoughts inform our actions in the moment and how our actions inform our thoughts. The awareness of what’s going on for us internally creates the choice of action and therefore, paved way for us to not simply go about on autopilot, but to consider each moment as a moment into itself. We can choose over and over again, consciously, from our higher functioning brain to live more integrated, productive lives. Mindfulness allows us to integrate the experience of living without being rushed from one place to another, hurrying from one activity to another. This week, we’re looking at putting everything in its right and perfect bucket. I want to give some direction as to how to get out of feeling overwhelmed (If that where you are) and how to get organized so that there is calm in the order. Take the things you are worried about: your lists, your lists of lists, all that is rattling in your head, all the creative ideas and solutions that come (conversations, reading, what you see online) and put the item of interest under one of these buckets. Download a free Productivity Worksheet to help you GET ORGANIZED to see what is on your heart - a visual of what needs to be done, and a way to prioritize what is important. Today’s podcast is about a 5 letter word that baffles us all- F-O-C-U-S: Focus!! Staying focus is a challenge for creative beings. If we are channels of creativity, staying focus requires us to by choice narrow down our open and available readiness. We are effectively choosing to isolate and manage and channel our creative ju-jus into one focal point. If we are able to balance our enthusiasm with our laser focus. Even or 10 - 15 minutes at a time, we may get our projects done in record time, after all. Whatever our past is, even if we’ve done work around comparison, we still might come face to face with the self-criticism and self-judgement that arises when we "mean talk" to ourselves…when we do not feel like we are enough, or up to par. We then question our path, and begin to wonder why we even got started in the first place! And then the mean girl voice - that inner critic within our consciousness rises up …and we are tricked into believing the is our Truth. What to do to get unstuck? Find out in this episode. Our 1st episode of season 2 is here! This episode is all about how we travel the journey of entrepreneurship and supports you to be present and engaged in your own process of becoming. Season 2 is about our journey (collectively and individually) as an important path of living an awakened life - and to do so with presence as an entrepreneur. We will talk about the nuances of the rhythm and energy that most, if not all entrepreneurs, face. No matter where you are on your unfolding path, our blog and podcast will help you stay focused, present and authentically on track to living your best life. How NOT to Avoid the Void, but to stay the course and be present to what is. As we fall upon the autumn season, change is in the air and so it is! How do we ask for guidance to stay the course and lean into the change? More than just coaching, this podcast to be a space to explore the inner journey - to go deeper, addressing a balance of head and heart, integrating mindfully our whole self so that we are not operating from just one part of us and not the other. We will consider mindfulness in our choices: the spiritual path of building an online community, challenges (and ways to overcome them), continue to offer applicable tools, and (on a process level) how to foster and hold space in the new platform of today’s media and technology. Today's episode is the last of a three part series podcast on heart-centered social media and the practice of the presence. This episode is about BEING UNDERSTOOD on Social Media, and what we commonly and mistakenly do to sabotage ourselves whether knowingly or unknowingly. 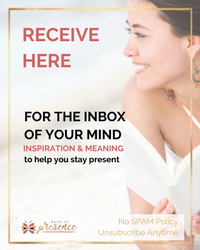 Be sure to download the FREE Mind Map and visioning meditation that goes along with this amazing work of staying in alignment with your true self. Today's episode is the 2nd of a three series podcast on heart-centered social media and the practice of the presence. This episode is about BEING HEARD on Social Media, and what we commonly and mistakenly do to sabotage ourselves whether knowingly or unknowingly. Be sure to download the corresponding meditation and clarity worksheet to clear blocks and get heard on social media today. Today's episode is the first of a three series podcast on heart-centered social media and the practice of the presence. This episode is about BEING SEEN on Social Media, and what we commonly and mistakenly do to sabotage ourselves whether knowingly or unknowingly. And what we do, whether knowingly or unknowingly, that keeps us from being 1000% ourselves in social media - to be wholeheartedly and authentically You - to be the one and only - the original and inspired, guided and vision led YOU! Be Sure to Download the FREE Guided Meditation Practice to help you align with your purpose and mission so you can stand out. Download the free meditation that goes with this podcast. This episode is about Best Practices for Posting on Your Facebook Fan Page. These 11 quick and simple actionable steps will help you jumpstart your success on your Facebook page and get your going on the right path. Listen in and download the FREE Checklist to get started today. These 23 tantalizing tips to set up and maximize your Facebook Fan Page will jumpstart your success on marketing your business online. This podcast includes a downloadable checklist to keep yourself on track. As of June 2017 there are 2.01 billion monthly active Facebook users which is a 17% over last year. This information is just for those of us who might have lingering doubts, statistically Facebook is too big to ignore. If you are wondering whether your customers are online, that should answer your question. This episode is on the 5 secrets to producing creating highly engaging, attractive, professional content that will be sure to turn heads. It is full of graphics resources for you to explore, including a free 6 day social media content creation course. The content of this episode is to help you produce AMAZING content that is a reflection of who you are, what your brand is, what you represent and ultimately how your service, product of program is perceived.